When any type of emergency happens what people usually think of first is having plenty of food, water, and ways to stay warm and safe. While these things are obviously important, having a way to communicate with others will be a crucial tool that many of us may overlook. The following information discusses why a CB radio will be essential during an emergency situation. There are numerous disaster situations in which cell phones and the Internet would be useless. During 9/11 the cell phone networks on the East Coast were overloaded and crashed. In almost any type of disaster situation the sheer numbers of people trying to use their phones or computers all at the same time will likely disrupt service. The price, the lack of licensing, and the availability make the CB radio ideal for most preppers and anyone who simply wants an alternate form of communications for an emergency situation. With a CB radio you can receive information in real time and transmit it immediately to others in your area. CB Radios, or Citizens Band Radios, don’t require a license and are ideal for short range communications. Depending on the landscape, your CB radio would have a range of up to 5 miles. With signal boosters and antennas, you could increase your range up to 20 miles. At full legal power the CB’s range would vary dramatically, depending on the attachments and the surrounding terrain. All you need is a CB and an antenna to get started. There are 40 channels on a CB radio. Channel 9 is universally known as the emergency channel. CB radios can be operated from inside your home or your vehicle. They’ll operate on the car’s 12-volt electrical system. Setting up a CB radio in the home can be done with a motorcycle battery, a gel cell battery, or a converter. While a ham radio can transmit at greater power levels and in general provides more extensive options, there are several reasons why it won’t be ideal during a crisis situation. One of the drawbacks of using a ham radio is that it does require a license. During an emergency situation it’s possible that the government may shut down those with a license, not seeing a legitimate reason for them to operate during an emergency. Another problem is that there just aren’t that many people who operate ham radios. 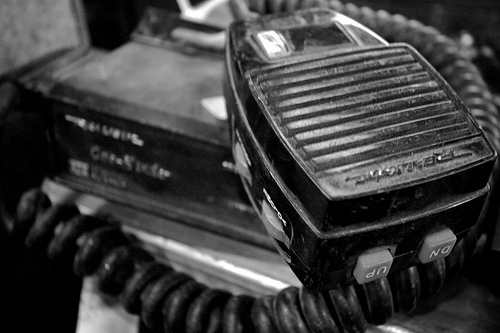 With CB radios, there will be considerably more people to communicate with during a disaster. While the range for a CB radio is fairly limited, there would likely be thousands of people transmitting messages across the country, creating a chain reaction in which information can be transferred back and forth over hundreds of miles. Whether it’s an EMP attack, a terrorist attack, or a natural disaster, preparing ahead of time by having a team of people in the same general area who all have CB radios would be an ideal way of communicating. But even if you’re the only one, it’s almost certain you’ll find others out there to communicate with. That may make the difference between life and death. If you’re looking for a CB Radio to add to your kit, check out the range from BearcatWarehouse, a retailer of Bearcat Scanners and other radio scanners. It’s really good to know that someone else gets it about CB being more versatile than a ham radio. For the inexperienced person I STRONGLY RECOMMEND buying a handheld unit with an integral aerial. Choose one that runs off common AA size rechargeable cells NOT THE SEALED BATTERY PACK types. It is also useful to pick one that can be powered using the cigarette lighter point in your vehicle. Always fully extend the aerial and keep it clear of other metal. Keep calm when using one, DON’T SHOUT at it because all the other person hears is distortion. Always use plain language in a slow clear voice. Learn the phonetic alphabet to aid spelling difficult words. Don’t expect 100’s of miles of range. Think more like within 3-5 miles BUT the more altitude you can gain the further you can speak and hear. It is usual practice for other stations to listen for emergency calls on the hour and half hour for 3 minutes. THIS MAY NOT BE 24/7. Be sensible, other people sleep just like you do. Finally if you can use a large plug in aerial when in a vehicle. You will need to tune that aerial to your radio. You will need a little patch lead (a short cable with a plug at each end) and a little box called a SWR meter. Tuning an aerial is NOT ROCKET SCIENCE. Look on YouTube for simple instructions.